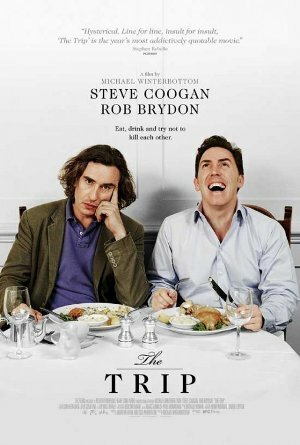 In Michael Winterbottom’s film, The Trip, the British comedians, Steve Coogan and Rob Brydon, play fictionalized versions of themselves. Coogan has been hired by the Guardian to do a series of articles about restaurants in the North of England. He plans to bring his girlfriend, Mischa (Margo Stilley), along on a five-day trip. At the last minute, however, she decides that they need a break in their relationship, and she leaves for America instead. Coogan asks several different people to come along, but they all turn him down. He then reluctantly asks Rob Brydon to join him. The film doesn’t have much of a story. It is mostly concerned with the give-and-take between two men who are similar in many ways, but nonetheless have very different personalities. Rob Brydon seems perfectly happy with his modestly successful show business career. (He hosts a radio quiz show.) Steve Coogan, a well-known comic actor in Britain, feels dissatisfied with his life. He aspires to become a “serious” actor. He wants to make what he calls “art house films”. Yet he is merely offered a role in a fatuous TV series. Interestingly, Coogan is willing to portray himself in a negative manner. He worries that his girlfriend might be cheating on him, yet he engages in a couple of one-night stands. One senses that he finds these encounters unsatisfying, but he feels compelled to do them anyway. At times, he is a bit churlish towards Brydon. The latter, on the other hand, seems well-adjusted and content in his marriage. As the film goes on, however, one begins to get the uncomfortable feeling that there is some truth to Coogan’s insinuations that Brydon’s approach to life is shallow and complacent. Yet there are moments when Coogan seems to wonder if perhaps Brydon knows something he doesn’t. This film deals, in an oblique manner, with the age-old question of whether one should accept things the way they are, or strive for something better. The film offers no definitive answer to that question. Instead, it suggests that there are serious consequences for whichever choice one makes. I’m told that this film was cobbled together from a TV series that appeared on the BBC. No doubt that explains why some of the scenes make no sense chronologically. There are, however, no contrived scenes of the kind that one finds in the typical Hollywood road movie. There are, though, some spectacular shots of the Northern English countryside. (I had no idea that some of these places existed in England.) There is an amazing deadpan scene in a ludicrously pretentious restaurant. The film’s ending seems anti-climactic at first, but then you realize it makes sense. At the screening I attended, there was a moment of silence, then the audience burst out in applause. This entry was posted on September 24, 2011 at 7:42 am and is filed under Britain, Cinema. You can follow any responses to this entry through the RSS 2.0 feed. You can leave a response, or trackback from your own site.